EXCLUSIVE POST – Radiation therapy has advanced dramatically in the past few decades and the rate of change is increasing rapidly. Innovations as a result of engineering and computer advances along with conceptual advances are making a dramatic difference. But the cost implications of some approaches are staggering. Some of the new technologies include improved computer assisted treatment planning (smarter and faster) , continuous imaging guidance (fluoroscopic, stereoscopic, and cone beam CT), robotics, more precision, higher dose rates, gating of the beam to track moving targets, stereotactic treatments and hypofractionation (or giving much larger doses fewer times) – all with the goal of greater efficacy, less side effects and less time under treatment. 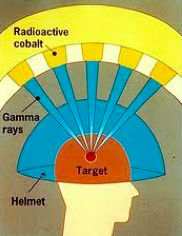 In the past stereotactic radiation therapy such as with the Gamma Knife was only used for brain tumors. The patient was immobilized in a bolted head frame and the radiation was applied to the tumor with multiple, sometimes as many as 200, separate narrow beams that all converged on the tumor. In this way the cancer received a very high dose of radiation in one treatment yet the surrounding normal tissues were minimally radiated. Newer devices allow stereotactic treatment not only for brain tumors but also cancers elsewhere in the body – overcoming the problem of motion caused by breathing or even heart beat and blood flow. The combination of continuous imaging, motion detection and robotic guidance combine to allow effective treatment. Stereotactic body radiation treatment (SBRT), also known as stereotactic ablative radiation therapy, appears to be a very useful new approach to many otherwise difficult to treat cancers such as in the lung. The stereotactic concept grows on the use of earlier techniques where the cancer is treated from multiple angles such that the tumor receives a large dose but the normal tissues receive much less. Then stereotactic means that the tumor is imaged and the radiation adjusted to directly attack the cancer and not the normal tissue. Add robotic guidance based on motion detection and the concept becomes very powerful. Increasingly, now the added concept, called hypofractionation, is to give a much higher dose of radiation per session, with much greater accuracy, thus sparing normal tissue and requiring many fewer sessions. Much SBRT is done in 3-5 fractions. (Compare this to the more typical approach of multiple, perhaps as many as 45, fractions over as many days or more.) With robotic control of the equipment from outside the treatment room, less time is wasted by the staff moving back and forth to make adjustments and less time on the table for the patient. A related innovation is to link actual delivery of radiation with the patient’s breathing parameters (gating). This is done with an infrared device that observes motion and turns the radiation beam on and off during the cycle. Other tracking and targeting technologies are in use or under development. This can be of great value in lung cancer because the target is constantly moving but still useful in other cancers as well. This greatly reduces normal tissue damage occurring as the lungs move with respiration. It also means that the cancer gets a higher dose as the physician is less encumbered by a concern for damaging adjacent normal lung. The concept of delivering a single high dose of radiation (as done with the Gamma Knife technology for brain cancers) rather than multiple smaller doses can be especially useful for patients with painful cancers metastatic to the spine. Immediate pain relief is the goal and with the newer treatment planning devices and treatment delivery machines it is possible to give a large single dose successfully without damage to the nearby spinal cord. Proton beam has been especially effective for tumors in difficult to reach areas such as brain stem cancers that are not amenable to surgery, don’t respond to chemotherapy and for which routine (photon beam) therapy will cause too much collateral damage. Since children are growing and their tissues are rapidly dividing, proton beam radiation has great potential to limit the damage. It may prove useful for certain tumors that are otherwise small but in locations, like the base of the brain, that are difficult to get at with current approaches. Today, the most common tumor to be treated with proton beam is prostate cancer, for which Medicare allows payment. Indeed, it is the market for treatment of prostate cancer that justifies the nearly $200 million dollar expense of the building, cyclotron and delivery device. The treatment concept for prostate cancer is the same – greater efficacy with less collateral damage. But proton beam therapy is incredibly expensive and there is precious little evidence that protons are clinically superior to photons (X-rays). What needs to be determined therefore is whether the added benefits of proton beam for a cancer like that in the prostate is actually sufficient to justify the cost. Certainly it is economically impossible that all patients with all cancers needing radiation will be treated with very expensive proton beams. Should Medicare decide to limit or completely curtail its coverage of prostate cancer, the business model fails and these centers will probably close. Yet it is clear that children and some adults will be very fortunate to have this treatment approach. The question is where to draw the line. Clinical trials will bring forth the answer. What is clear is that a megatrend in cancer treatment is a steady, indeed rapid, advance in the ability to deliver radiation therapy in a more effective, more safe manner, often in much less time than in the past.